Posted by pacejmiller in Food, India, Travel. We arrived at our hotel at (I can’t remembere exactly when) about nine in the morning, checked in at the Taj Tristar and promptly collapsed into slumber, having just come halfway across the world in a particularly uncomfortable economy class (damn you Cathay!) and budget travel (no complaints). The only other non-Indian friends attending the wedding (a former colleague and his wife originally from Sydney but now living in London) flew in via Dubai about 6 hours before us and had already gotten some sleep and were nice enough to wait for us until we got some much-needed shut eye. We still hadn’t gotten enough rest by 1pm, but it was time to get out and about. Time was of the essence. My marrying friend had organized a private taxi to take us around Hyderabad for the day, and since the wedding didn’t officially start until the next day, we were determined to make the most of it. Our taxi driver, Malik, was an affable guy who knew far less English than he pretended to know. Nevertheless, his assignment for the day was to take us wherever we want to go. Thankfully, my colleague from London had done some background research and, unlike me, knew a thing or two about Hyderabad. The first thing we did was have lunch at this “high class” vegetarian-only restaurant called Minerva, which isapparently one of the best in Hyderabad. I must say the exterior did not instill much confidence, but the inside looked clean enough, even if it was a bit dark. With non-English descriptions of the dishes and no decent English speakers around, we randomly selected three curries and lots of naan. Too afraid to drink the regular water, we opted for bottled cokes with no ice instead. 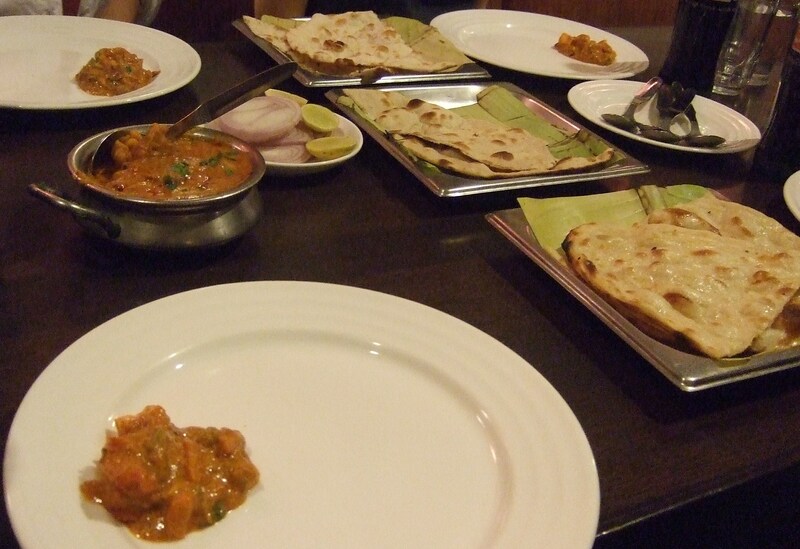 Most restaurants overseas serve traditional North Indian food which is quite different to South Indian food (which is what we had), so I was prepared for the worst. But surprisingly, the food was pretty good, especially the garlic and butter naan and this cauliflower curry. The curries are more watery and not as thick as what we have overseas, but that’s to be expected when you don’t put in 50 grams of butter and half a litre of coconut milk into every dish! I’ll have to do an entire post on the food later. 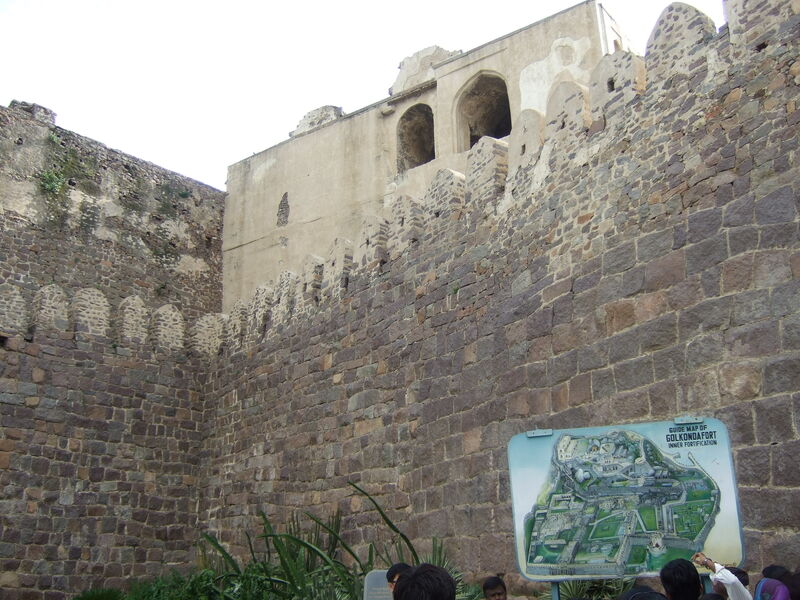 The afternoon was supposed to be spent sightseeing, but we only ended up going to one place – Golconda Fort. It’s an impressive fortification that reminded me of some of the forts we saw in Greece. The entry fee was like 5 rupees for locals and 250 for foreigners. That’s just the way it is over here, and honestly, no one should complain. As tourists, we can afford a little more. 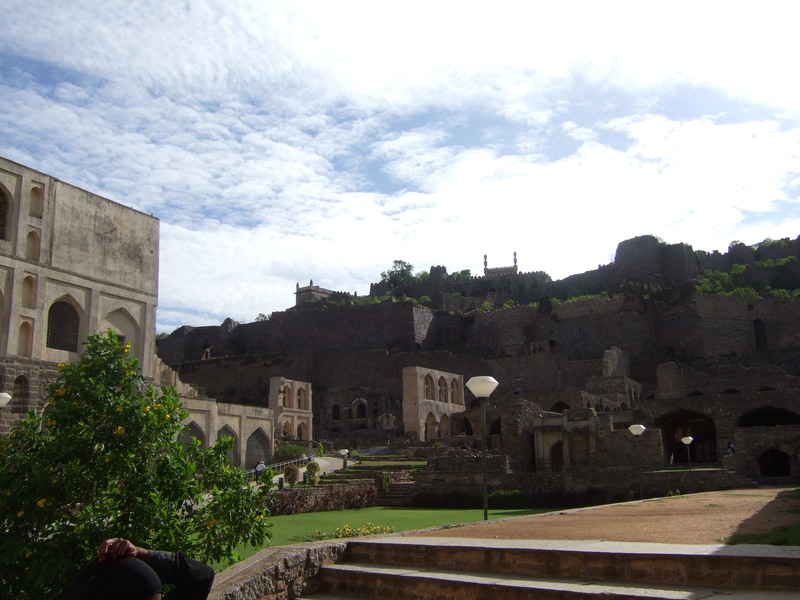 As soon as we entered a “local” guide began to follow us and give us the lowdown on Golconda Fort. His English was pretty good and showed us this hall where if you clap your hands the sound travels all the way up to the top of the fort (this was so the King could be warned if enemies were coming). The guide then, naturally, asked for 600 rupees to talk us through the rest of the way. After much persistence, we gave him a 200 rupee tip and sent him on his way (in hindsight it was a handsome sum). We were jet-lagged and lazy and there were lots and lots of stairs. We walked about halfway up and decided to bail. What did we do instead of going to more sightseeing spots? The Taj Krishna (a superb 5-star hotel) for a drink and to watch the football (ah-hem ‘soccer’) World Cup! We then headed back to Paradise Hotel (not to be confused with the one where the awesome reality TV show was filmed) to have some of its famous Chicken Biriyani (essentially chicken fried rice). To be honest, I don‘t know what the fuss is all about. My colleague reckons he had better in London. God we’re such pathetic tourists. In our defence though, all of Hyderabad is a sightseeing experience. The thing you notice most about Hyderabad driving along the streets is the shocking disparity between the rich and the poor. Well, not necessarily “rich”, but against the raging poverty, even “barely middle class” feels affluent. There are hints of commercialization and urbanization everywhere, such as giant billboards (mostly soft drinks and telecommunication companies), modern architecture and fine commercial buildings (such as banks and hotels) – but just the next block down, or sometimes just the next building down, it’s the most dreadful dilapidation imaginable. Yeah I felt the heat man…felt it bad!! Yea it kills lol. Electricity one time went out when i went there. I sweated like crazy after a couple of minutes lol.